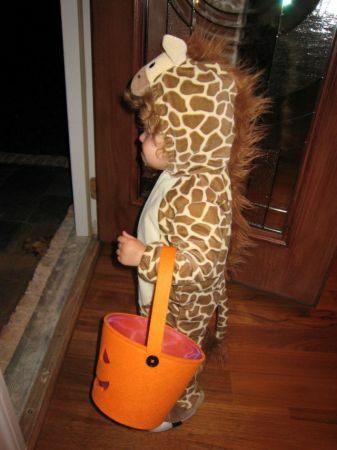 Mara’s Blog » Happy Halloween From Mara The Giraffe! 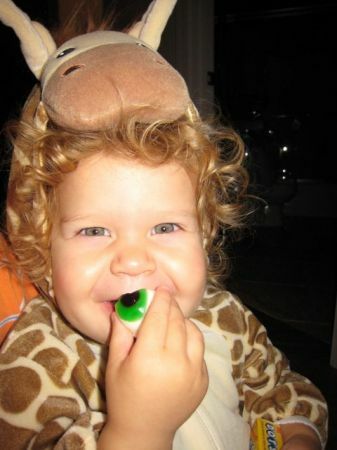 Happy Halloween From Mara The Giraffe! This was Mara’s second Halloween but probably the first she sort of understood. We trick-or-treated just our street tonight starting around 6 p.m. She didn’t get out the words trick-or-treat however she did manage to be the little miss mighty politey that we all know and love by saying, “thank-you” and “good-bye” at every house. At first when we arrived on the door steps she seemed not to know what to do. When our neighbors stuck their big bowl of candy in front of her she would just gaze into it. With a little encouragement she picked up a few pieces! What really cracks me up about these pictures are her faces and expressions before going out. She was kind of grumpy and not very happy. Then once we returned she was all smiles. Yes…that is an eyeball she’s eating. I got some really great gummy ones at Costco this year. They are merely the consistency of a gummy worm or bear but with creepy detail like an eyeball. Mara digs them. 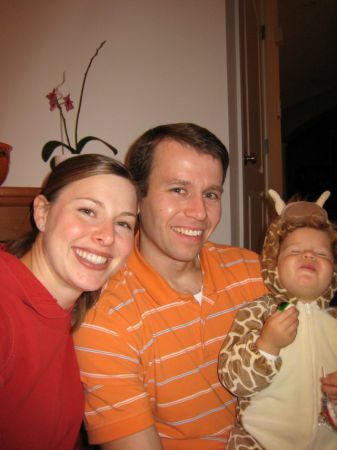 Our neighbors kids appear in the pictures too. Check them out! Be sure to click one of the pictures to see the whole album. Also Mara had a costume parade today at her daycare. Stay tuned because we’ll be posting some video from that event! Isn’t Mara a relative of Mr. Sprinkles???? We thought since she loves Mr. Sprinkles so much she can pretend to be one of his kind for Halloween!